Feel like the captain of your own room with these DIY automatic doors. I have found the perfect project for all of my fellow Star Trek fans out there. Why walk into a room through a regular door like a chump when you can strut into your pad like Kirk on the prowl through air powered sliding doors. Enter via these bad boys and watch green skinned aliens swoon as the doors close behind you without you lifting a finger. An enterprising (get it?) young engineer has designed this real world Star Trek entrance so that it is simple enough to work as a do-it-yourself project (though one that involves house renovation). You can find all the information to build your own set on the Instructables website. Even if you don’t have the urge to tear down your walls and install copies of these doors all through your home you can still enjoy watching them in action. Check out the brief demo of the doors, followed by an extended tour of their capabilities, in the videos below. That ‘woosh’ sound makes my heart flutter. In this extended tour you can see the internal locking mechanism for the doors, as well as a look into how they are powered. Make sure to check out the doors’ appearance from the outside starting around 2:20. The inclusion of a digital keypad is pretty wonderful. 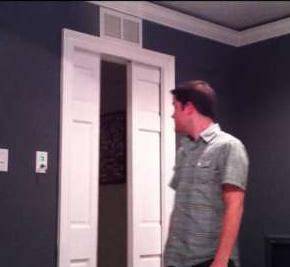 The creator of these doors is ‘Marc’, a 26 year old Star Trek aficionado and engineer. He’s also the co-designer of a plush toy that interacts with the iPhone (Xachi Pet). While he only recently uploaded video of his sliding doors, according to his blog Marc actually made them back in 2006. In true Star Trek fan style he was living in his mom’s house when he installed this icon of his love for the science fiction franchise. Parts for the project cost around $500, with untold amounts of labor. Pictures of the installation make it look like Marc really tore his mom’s house apart putting in the air compressor and pocket doors. Make sure to warn your own mother before you follow in his footsteps. If you really want a pair of these doors for your home (and be honest, you do want them) you may be able to purchase a set someday in the future. According to his blog, Marc has been dreaming up a “consumer” version of the doors for years now. His work in the medical engineering field has made him realize how many innovations and improvements the project really needs. Chief among them would be an emergency back up system in case of power outages. Apparently he and his mom have been locked out of the room twice in the past four years and had to force the doors open. I can only hope that he roared like a Klingnon while he pried them apart with his bare hands. Now, if you’ll excuse me, I need to go speak with my landlord about a few minor renovations I’ll be making around my apartment.